A lot has been made about the Big 3 in Oklahoma City. And deservedly so. Anytime you combine a current MVP with two prolific wing scorers, it’s bound to draw a lot of attention. The results after four games can be summed up in three words: Work In Progress. Six points? Six points for current MVP, Russell Westbrook. Much of the credit needs to go to the Utah defense, who executed a great defensive game plan. But it didn’t much seem like Westbrook was trying to attack the defense, either. He almost looked like he was settling. And the words Westbrook and settling don’t necessarily go together in a sentence. The Oklahoma City hold two first round picks in this year’s draft. Their own (No. 29) and Dallas’ first rounder (No. 21) obtained from Houston in the James Harden trade. In a daft and offseason that will be filled with intrigue heading into July 1st, assets are a powerful thing to be in possession of heading into the draft. The Thunder are on the cusp of becoming a championship team, having been in 3 of the last 4 Western Conference Finals and being on the losing end of the 2012 NBA Finals. With most of the core pieces in place, the Thunder may use these assets to get that final piece or two to finally get over the edge. Other than the two first round picks in a pretty loaded draft, the Thunder also have the $6.6 million dollar Traded Player Exception (TPE) they obtained from the Kevin Martin sign and trade last season. The TPE can be used to trade for a player without having to add any players in order to make the salaries match. For example, Gerald Henderson of the Charlotte Hornets makes $6 million dollars in salary. If the Thunder wanted to trade for him, they could offer the Hornets their TPE for $6.1 million dollars and a draft pick or the draft rights to one of their Euro-stashes. In addition to the TPE, the Thunder have 2 players in the final year of their contracts. Kendrick Perkins will be making $9.4 million dollars and Nick Collison will be making $2.2 million dollars next season. In addition, if the Thunder pick up Hasheem Thabeet’s final year, he’ll be making $1.25 million. In the NBA, expiring contracts become valuable because the receiving team can trade away a player (or players) of equal cost, but usually with more time left on their contracts. For example, let’s hypothetically say the Spurs were needing to trade Tiago Splitter to make space for Kawhi Leonard’s upcoming extension. Next season Splitter will be making $9.25 million, but has 2 more years left on his contract after that. The Spurs could hypothetically trade Splitter to the Thunder for Perkins and his expiring contract. Also, the Thunder have a slew of young players all making under $3 million dollars a season (Reggie Jackson, Jeremy Lamb, Perry Jones, Andre Roberson, and Grant Jerrett) and two valuable Euro-stashes in Tibor Pleiss and Alex Abrines. The inclusion of these players in a deal are usually the things that either make or break a deal. With Thabo Sefolosha going into free agency and some of the depth of the team either not coming back (Derek Fisher and Caron Butler) or getting older (Collison), the Thunder will probably be in the market for a starting 2-guard and some veteran depth for the bench. So what are some possible targets for the Thunder? With Chicago wanting to try their hand in the Carmelo Anthony sweepstakes, the Bulls will have to rid themselves of some salary before even attempting to offer Anthony anything close to a max contract. The Thunder obtained some assets from Miami when they were making their run at LeBron James (and Chris Bosh) in 2010. In that draft, they obtained SG Daequan Cook from Miami and the No. 18 pick for the No. 32 pick. The Bulls will shed some salary by releasing Carlos Boozer via the amnesty clause. 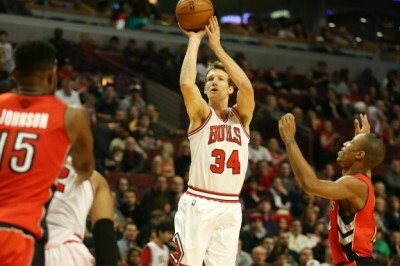 But the Bulls will probably need a little more salary shed before they can offer Anthony a max (or very near max) deal. While Dunleavy is a weapon as a 3-point specialist, they probably won’t want to get rid of any of their young (cheap) wings such as Jimmy Butler and Tony Snell. In addition, rumors that Bulls’ Eurostash Nikola Mirotic is ready to join the Bulls may necessitate that the dump even more salary. The Thunder could target Dunleavy with the TPE, and then try to obtain one of the Bulls’ two first round picks (16 and 19) for the Thunder’s 29th pick. That way, the Bulls shed salary, but still have an asset that allows them to obtain a player in the future, in the form of the TPE. Also, the Bulls trade one of their 1st rounders, but stay in the first round with pick No. 29, albeit at a cheaper price. At the trade deadline this past season, there were rumors that the Knicks and Thunder were discussing a trade centered around Iman Shumpert and the Thunder’s first round pick. At the time, it was not known whether the Thunder would have a 2nd first round pick. With the season over and the Knicks under new management, it could be a good time to revisit those talks. Depending on how Phil Jackson and coach Derek Fisher view Shumpert could determine whether he is available during the draft. Probably the most difficult of the trades to do. Difficult, because Afflalo makes $7.6 million, which is too much to fit under the TPE. Unfortunately, the TPE is an all or nothing deal. Either you are able to obtain the player using the TPE or you’re not. TPE’s cannot be used in conjunction with something else in the same transaction. 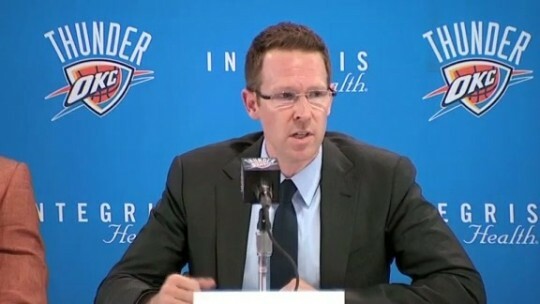 At $7.6 million, the Thunder would have to trade a player or two along with assets such as draft picks or Euro-stashes. 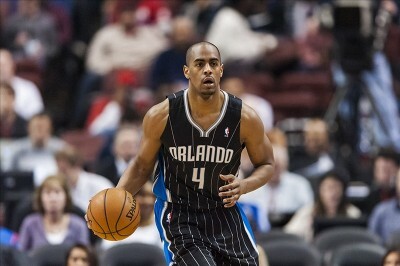 So then the question becomes: Do the Thunder view Afflalo as the final piece of the puzzle? If you follow the history of the Thunder, you know that they trust in their system and their developmental program. Jeremy Lamb and Perry Jones will be entering into their 3rd year (or as its called in Thunder lore “The Year”) and Steven Adams will have an another offseason’s worth of training under his belt. So, no, I don’t think they will trade for Afflalo. Players like Shumpert and Dunleavy will take less assets to obtain, so I can definitely see the team going after someone like that. In an offseason that may feature LeBron, Carmelo, and Bosh as free agents, Kevin Love as a moving target, and a vaunted draft class, you can expect to see plenty of moving parts around the league. With assets in hand, the Thunder may throw their hat into the fray to see what they can come out of it with.